We discussed the location and topography of the Middle East, and the differences between modern political identities and the identities that we give past cultures. The Levant, Anatolia, Mesopotamia..... these terms cross modern boundaries, and so they're useful in the present day. Climate change, sea level rises and the impact of humans have had great impact in this area. Since around 10,000 BC it has gradually lost its forest and grassland cover to desert. It's no coincidence that the earliest evidence of deliberate artificial irrigation of fields comes from the Middle East, and water control in the modern age is at the heart of many political tensions. 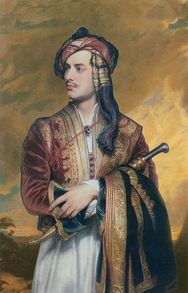 Lord Byron wore Albanian dress when he posed for this painting, and with him being a wealthy dedicated follower of fashion this was of course at the cutting edge of style. Clothes, art, music, all followed the Grand Tour trails eastwards into the lands of the Ottoman Empire. The Ottoman Empire covered much of the Middle East until the 1920s. In its fading years the weakness of local governors combined with the ambitions of western powers made it a honeypot for gentlemen, that is, men from privileged backgrounds, who might combine a little diplomacy with a touch of travelling and a hint of digging for treasure. The names and approximate locations of many sites had persisted in memory, through their inclusion in the Old and New Testaments. Some spectacular excavations took place between the 1840s and 1920s. In 1906 James Henry Breasted coined the term 'The Fertile Crescent' to describe the best farmland and best-irrigated zones of the Middle East. The term has gone out of fashion, only to return in recent years. 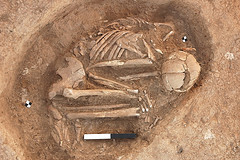 Embarrassingly, modern DNA analyses suggest that there was indeed some kind of population movement of farming people from the Middle East into western Europe (click for more details). In the middle part of the 20th century excavations revealed more about the early origins of civilisation in the Middle East. At sites such as Jarmo, east of Kirkuk in Iraq, an early village of about 20 simple mudbrick houses dating to around 7000 BC was found in the 1940s. Even at this early date the people were trading as well as farming - obsidian found in the excavation came from near Lake Van, some 200 miles away. The discovery of the very large Neolithic settlement at Çatalhöyük in southern Turkey challenged the picture that a gradual transition was made from small villages to bigger towns. After a 30-year period of neglect, excavation has recommenced at Çatalhöyük and continues to the present day.